Patrick Norris, Associate Specialist, Commercial Brand Marketing, BISSELL Homecare, Inc. Cleaning performance is critical to a brand like Sanitaire, which has always been among the industry leaders in commercial, portable floor care equipment. Securing the best third-party certifications available demonstrates to consumers that Sanitaire’s product claims are supported by the highest industry-standards for testing, providing an important competitive differentiator for the brand in a crowded marketplace. Sanitaire is a 60-year old brand that has continually set the standard in commercial cleaning products. According to end user research, Sanitaire vacuums and its competitors are very highly rated in terms of cleaning performance. However, there wasn’t much differentiation within the industry. Sanitaire sought out the best third-party certifications, including the asthma & allergy friendly® Certification to support its product claims and raise the bar for its industry-leading cleaning capabilities. This campaign took the cleanliness messaging deeper, focusing on the education and healthcare industries specifically and targeting the facilities with the highest standards of clean. The rigorous standards and process of the asthma & allergy friendly® Certification program was valuable from a scientific R&D and product development perspective. In fact, it led to several product-enhancing modifications that truly set the EON ALLERGEN apart from its competition and making it the first certified commercial vacuum for allergy-aware consumers. 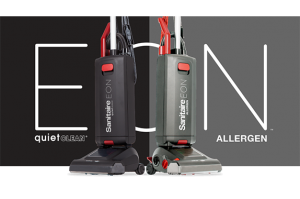 The EON ALLERGEN was launched in July 2018 as the first commercial vacuum certified by Allergy Standards and the Asthma and Allergy Foundation of America, setting a new standard for when clean matters. Sanitaire continues to set the standard in commercial cleaning products, being the first in the industry to secure third-party certification to shine a spotlight on its cleaning capabilities. The EON ALLERGEN is also LEED qualified and certified gold by the Carpet and Rug Institute (CRI), the industry-leader for testing soil removal, emissions and carpet appearance. Sanitaire understands the importance of reducing exposure to allergens and asthma when cleaning a facility and continues to expand its suite of certified products for its customers. Sanitaire continues to work with its partners and retailers to communicate the value of third-party standards, like the asthma & allergy friendly® Certification program, that can meaningfully distinguish products in the minds of health-conscious consumers.